Magic Bus is Asia’s largest mentoring organization that nurtures children trapped in poverty along their journey from childhood to livelihood. This NGO uses sports as a medium to inculcate four important ingredients in a child i.e., need for going to school, maintaining trust and hygiene, adopting an ethical approach and practicing honesty in all they do. Magic Bus uses an in-house devised “Activity Based Curriculum” to seek children participation. The curriculum includes use of sporting activities as metaphors to change behavior in the areas of education, health, gender and livelihood which meets universal standards laid down by UNICEF. Programmes are conducted once a week either in an open play ground or a classroom. The curriculum is delivered by well-trained local volunteers and home grown leaders. These leaders mentor children constantly and act as catalysts for community change. To reach their goal of nurturing a million children by 2015, Magic Bus has partnered with Municipal schools/State Governments across India to include sports-based curriculum as a part of their teaching. To encourage parents to send their children (both boys and girls) to the Magic Bus programme, a “Behavior Change” programme is conducted for parents. Magic Bus touches more than 220,000 lives every week by delivering its uniquely designed programmes for children between 7 and 18 years of age. With dedicated support extended by 8,000+ trained youth leaders across India, Magic Bus is well poised to impact several more lives in years to come. Total Income: Recorded Y-o-Y growth of 22% in total funds raised in FY13. This is on account of increase in donations received from foreign sources and individual donations. Total income in FY13 was Rs208mn as against Rs170mn in FY12. 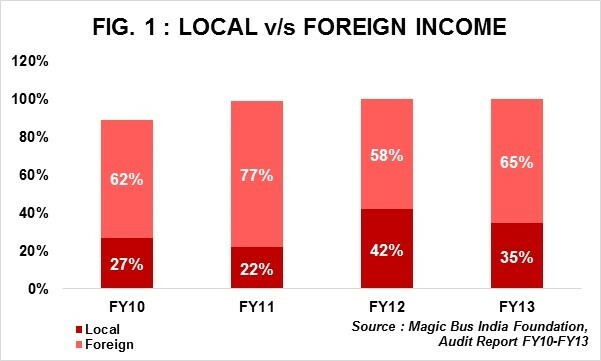 Income from Foreign Sources: Foreign donations increased from 58% in FY12 to 65% in FY13 (Refer Fig. 1). NGOs in a similar line of activities registered with us, receive an average of 30% of their total income from foreign sources. Magic Bus is among the few NGOs in this space to have received high percentage of donations from foreign sources as they have international offices in the US, London and Germany dedicated to raise funds from foreign sources. Total Programme Expenses: Spending on programme activities marginally increased from 85% in FY12 to 87% in FY13 i.e. Rs142mn to Rs167mn; complying with sector average of 80% - 85% (Refer Fig. 2). The increase is in proportion to an increase in total income received in FY13. Overheads & Other Costs: Overheads in proportion to total expenses in FY13 reduced from 2.2% to 1.8% in FY12. 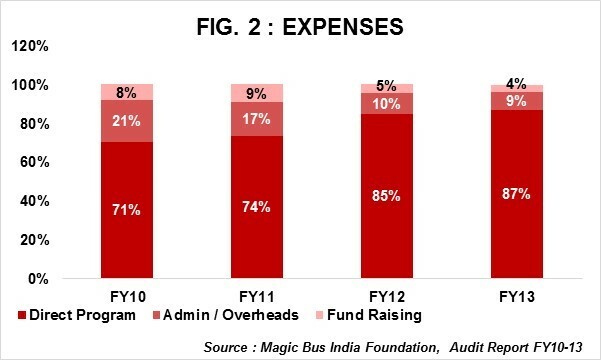 Magic Bus has demonstrated Y-o-Y reduction in its overall admin expenses; suggesting strong control on expenses and better utilization of funds. Corpus and Earmarked Funds: Trust Corpus was only Rs2,000 in FY13; unchanged from the previous year’s corpus as most targeted inflows are towards earmarked activities. Earmarked Funds was at Rs84mn; also remaining unchanged. Earmarked funds include: Centre Fund (Rs64.7mn), Fixed Asset Fund (Rs8.8mn) and Self Sustenance Fund (Rs10.4mn) in FY13. 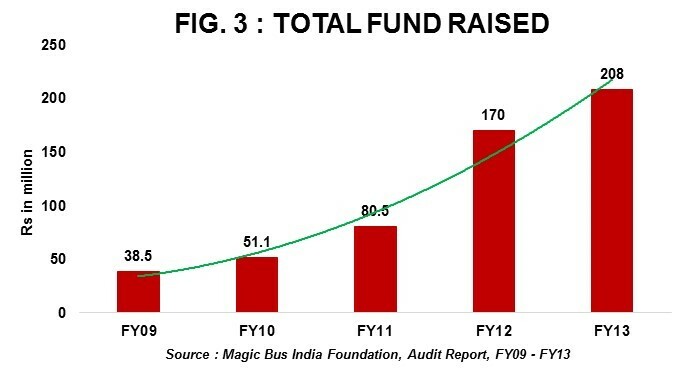 Income Growth: Posted an impressive 5-year CAGR of 58% in total income from FY09-FY13; indicating rising faith of donors globally in the Magic Bus story (Refer Fig. 3). Self Sufficiency Ratio: Self-sufficiency ratio reduced marginally from 44% in FY12 to 38% in FY13. (Self-sufficiency ratio measures how much of expenses can be met from own income – individual donations/corpus income/fee income). Increasing Employee Base: Employee strength has doubled from 376 in FY11 to 780 in FY13 which is in line with new geographies added in FY12 & FY13. The programme conducted by Magic Bus is people intensive and thus, such an increase in employee strength is justifiable. Donors/Partners: Supporters include not only business tycoons, but people of repute from the entertainment industry i.e. Bollywood who extend their time in conducting sessions occasionally. Shortage of trainers to train the Mentors/Youth Leaders. Lack of resources to translate the curriculum in regional languages. Opposition from local leaders in rural regions. Magic Bus has eminent personalities on their Board and Governing Council. The members participate actively in the functioning of the organization and devising the course programme. The Annual Reports are detailed and highlight the activities carried out in a given financial year. Magic Bus complies with regulatory norms and is accredited by Credibility Alliance.